Her comes 14th Edition of Khadhya Khurak. Khadhya Khurak is one of the premier food machinery sector trade shows in India. Khadhya Khurak is organised with the noble cause of uplifting the Indian Food Industry. 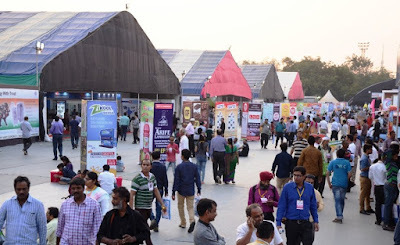 More than 135 exhibitors are present here, showcasing a vast range of food processing equipment, ayurvedic products, beverages, sweets and ice-creams, herbal products, edible flavors, refrigeration units and other related items. Fruitful business partnership deals are struck up during the event, which also offers excellent business networking opportunities to all corporate participants. Representatives from noted financial institutions, hotels and restaurants are also present here. Exhibitors will showcase products related with Dairy, Ice-cream, Beverages, Hotels, Restaurants, Bakery, Caterers, Sweets, Farsan (Namkin), Edible Oil, Confectionery, Sweet Candy units, Spices Udyog, Manufacturers of Plant, Machinery, Equipments & Packaging Materials used in Processing of Food, Manufacturers of Preservatives, Food Colours, Essences, Fragrances,etc. Lets take a step towards the uplifting our Indian Food Industry by KHADHYA KHURAK 2017.